With a career only spanning three albums (though I’m forever holding out hope a we’ll get a reunion and a fourth release someday), Marvelous 3 became one of my favorite bands and produced one of my favorite albums with ReadySexGo. 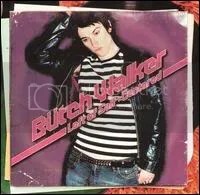 Marvelous 3 called it quits in 2001 and front man/songwriter Butch Walker surfaced in 2002 with this, his very first solo release. It’s very much a continuation of what Marvelous 3 had been doing with the great blend of glam, punk, pop and hard rock. Nothing but giant hooks and huge choruses. If M3 had stuck around and followed ReadySexGo with a new album, I can’t imagine it sounding much different than this. Unfortunately, Left of Self-Centered would be the last in-your-face hard rock/pop release by Butch Walker, I guess he’d rather write & produce those types of songs for other artists (Avril Lavigne, Lit, Fall Out Boy, Katy Perry, Pink) than himself because his albums since have been a bit more emo, mellow and acoustic than I would like. Butch certainly does have a way with words and great sense of humor. I like how the lyrics flow together and the next line plays off the previous one. The lyrics are almost as enjoyable as the music itself. “My Way” was the song during the opening credits of the awful Jason Lee/Tom Green movie ‘Stealing Harvard’, if I’m not mistaken. “Get Stupid with You” is a “hidden” asTrack 14. Track 13 is nearly 15 minutes of silence.